The ever intrepid architecture hound JCB spotted this article first, in the formerly un-navigable, now blessedly revamped New York Times 'T Magazine' online. 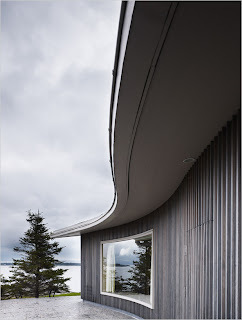 For those of you who missed the article, click HERE, and head straight over to check out one of the most astonishing houses up in this part of Maine. It is the Wm. A.M. Burden summer home in nearby Northeast Harbor, a joint collaboration between Wallace Harrison and Isamu Noguchi. 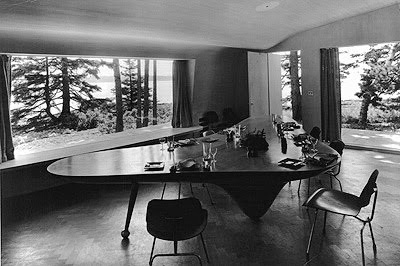 Harrison, often referred to as the Rockefeller family architect, had a summer home in the area, and had also designed the spectacular and much less disciplined Nelson Rockefeller house in nearby Seal Harbor. I first saw the Burden house when sailing by thirty odd years ago, a startling and seductive contrast to its stately shingled and turreted neighbors along the Mt. Desert shore. I remember for a moment weighing the idea of jumping ship and swimming to shore for a closer look. If you've ever swum in eastern Maine waters, you'd understand just how gobsmacked I was by this house. Sailboats, sadly, do not have brakes for moments like this, and in an instant we were round the point and the house had disappeared behind the trees, the Dilettante looking back longingly. Actually, I think I did for a second drop the jib sheet I was supposed to be tending. Mrs. Twombly was the former Florence Vanderbilt, the longest lived and last surviving of Commodore Vanderbilt's well housed grandchildren. By all accounts she was a formal and humorless woman. Her siblings put up such iconic houses as Biltmore, the Breakers, and Marble house. 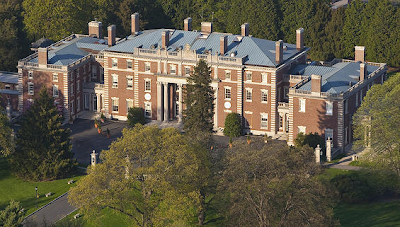 Mrs. Twombly's contributions to the family building spree included a Warren & Wetmore town house on the corner north of the Frick on 5th Avenue, Vinland, a vast Romanesque mausoleum of a house in Newport, and Florham, loosely based on Hampton Court palace, and despite its over 100 rooms, not exactly the best of McKim Mead & White's designs. Even great architects have bad days. In a private letter one of the firm's partners, William Rutherford Mead, wrote: "Twombly wants a house on the order of an English Country gentleman. I don't think he knows exactly what he means, and I am sure I don't..." Apparently, Twombly's grandson had no such doubts about what he wanted---a comfortable, modern sculpture for living. 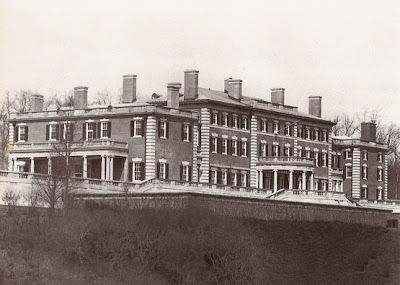 And the point is, lest I seem to have wandered too far, is that it's a long way from the Barberini tapestried marble halls of Florham and summer mansions in Newport to the sinuous curves of the Burden house on the rugged shores of Northeast Harbor. Every action has a reaction, and what a terrific (under)statement Burden made with his house. As long as you're in 'T' Magazine---and btw, how pathetic an attempt at hipness by the Times is that name? 'T' Magazine, 'W' Hotel---I guess the T stands for Trying Too Hard), check out the article about martinis. It brings home what some of we martini drinkers already know as gospel--that a proper martini is really cold gin, shaken with a drop of Vermouth, one small olive, not on a toothpick, served ice cold, straight up in a small stemmed glass. Despite the many (too?) gin martinis we have shared, you should admit that a decent vodka martini is acceptable -- so long as its only additions are a bit of vermouth and lemon zest. Gin, absolutely!! My stomach turns when I read restaurant menus advertising chocolate martinis, etc. Burden had a brother named Shirley who was a still and film photographer of some note. He taught a class at the college I attended and also was on the Board of Directors. Nice fellow, but could be impatient, like a lot of people with $$$. He had a house designed by the noted west coast architect Wallace Neff. ...and not incidentally, was married to Douglas Fairbanks's niece. I have a couple of his photography books, and have always admired them. And so with you on the martini menus. Almost a reason to leave a restaurant on the spot. 1. Wallace Neff designed a house in 1926 for actor Frederic March. The decorator was Beauport creator, Henry Davis Sleeper, and was one of his more famous commissions. 4. Brad Pitt & Jennifer Anniston bought it from Annenberg. Pitt removed much of the really lovely March/Neff/Sleep paneling (Pitt thinks he's an amateur architect, but he was too young to have heard of the Dilettante's "If A Building Ain't Broke, Don't Fix It" rule (see post). And that's how my mind works. Just holds scads of factoids like this waiting to be unleashed. unbelievable - you post the most spectacular modernist house ever and these lushes are going on about gin. heavens to murgatroyd!!!! while i am a major fan of wright and bonkers for piles like that nj behemoth, the burden is such a masterwork. so many fantastic touches - my faves are that bookcase, the cypress and the curved ceiling. i can't say enough - its breathtaking. i would have jumped off the boat and i can't swim. LOL, thanks Packs, but in fact, this post was just a footnote and a directional arrow to the NY Times article. It's almost time for me to do a position paper about why I blog about houses..I have no style allegiances. Good is good, and it can take many forms, not just what is trendy today. And, speaking of security words, I posted on a favorite website earlier today, and the word was 'renthoa'. Best not to think about it. Looking forward to your House Manifesto. Having an allegiance to good whatever the form, is quite a delicious path to follow. How many of us look at these security words as a code sent from who knows where. Rather like HAL the computer from 2001 a space odyssey. Or the beginning of a bit of mental madness? Still makes for a morning chuckle. For example my word today is "turecolo". Code for true colors? Feeling ever so slightly defensive, I must tell Turner Pack Rats, that DED and I had already swooned over the unbelievably gorgeous house, which is without a doubt one of the most amazing houses on Mount Desert. But that was before the post and the add on about martinis -- a long time bonding point for DED and me. Or, as we have been known to say in unison -- Up! Dry! Olive! I am so glad yu posted this...to see the contrast with Florham is divine.